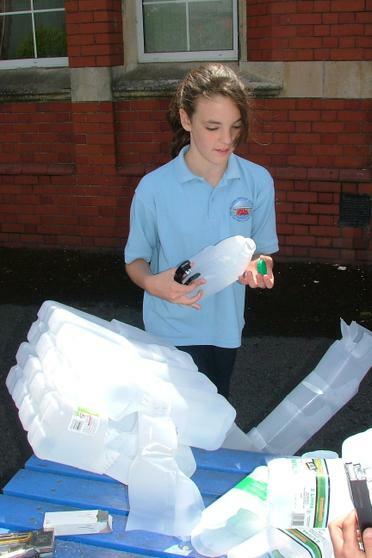 The school has always had a strong reputation for environmentalism and Art & Design so this was just another fun project that we undertook as part of that commitment. 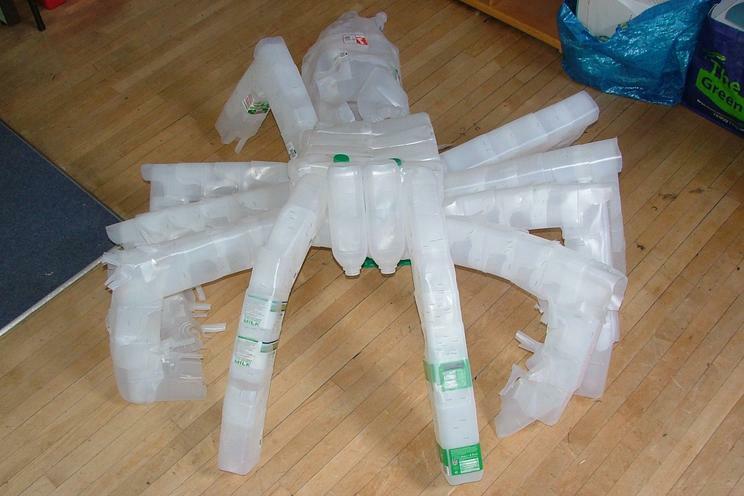 The idea is simple enough we use some form of old packaging or rubbish to make a sculpture. 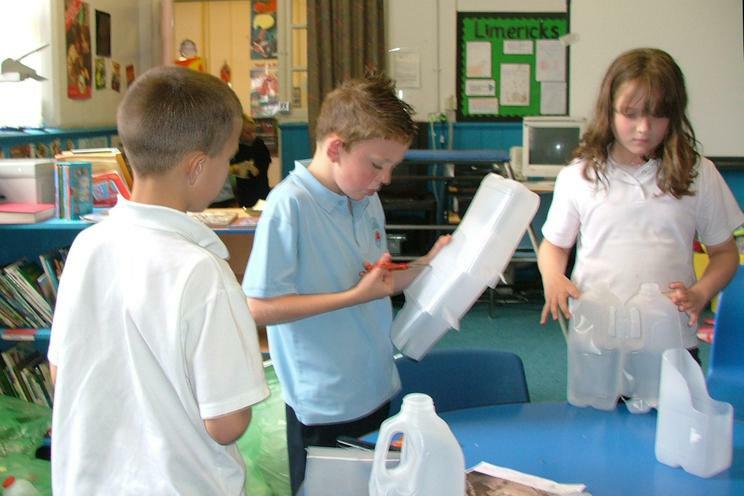 First job then was to look at what material we would use, originally we discussed using flotsam washed up on the beach to make a turtle or a whale that illegal dumping at sea would affect. 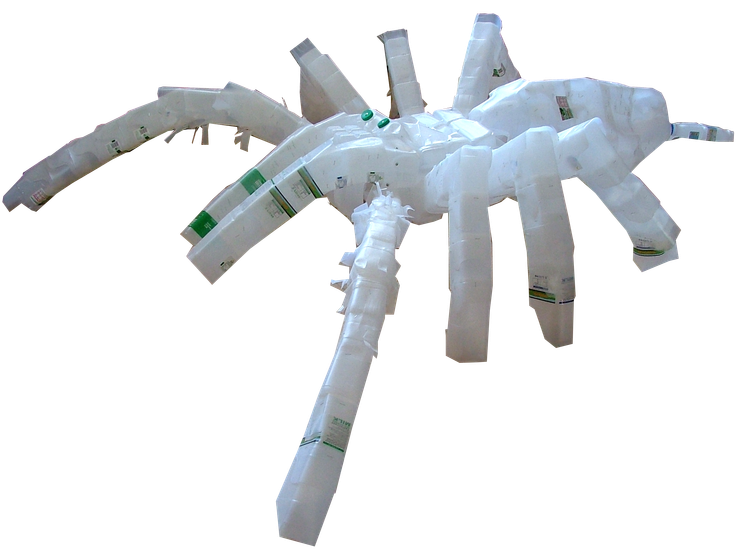 Aluminium cans would help look at the problems of Bauxite strip mining in rain forests, and so we could do creatures that live here. 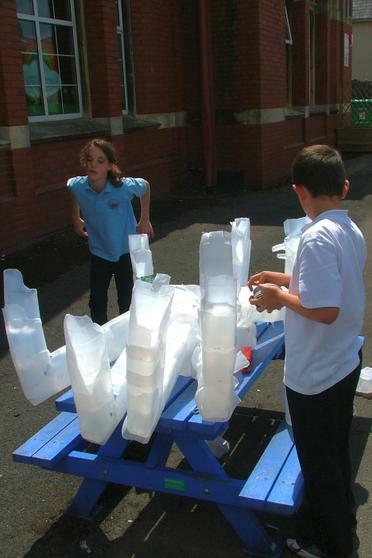 In the end we chose plastic milk bottles for a far more practical reason - we had lots left over from the infants 'Milk Bottle Igloo' all washed out ready to be recycled. 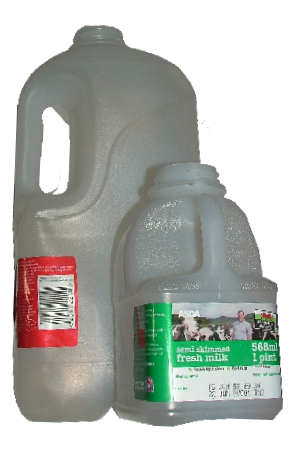 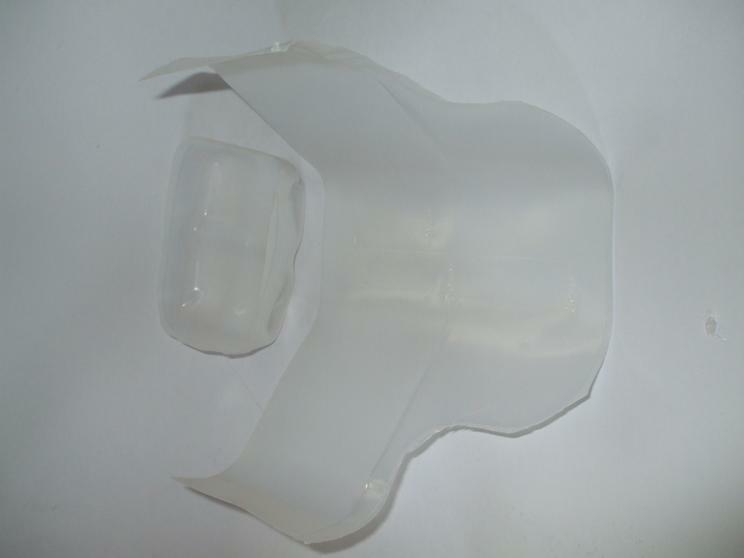 The milk cartons today are made from a special type of plastic known as High-density PolyEthylene (HDPE) which is great because it can be easily recycled after use into more milk cartons cheaper and more efficiently than even glass. 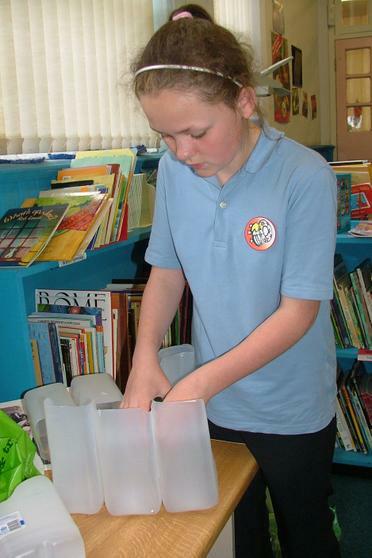 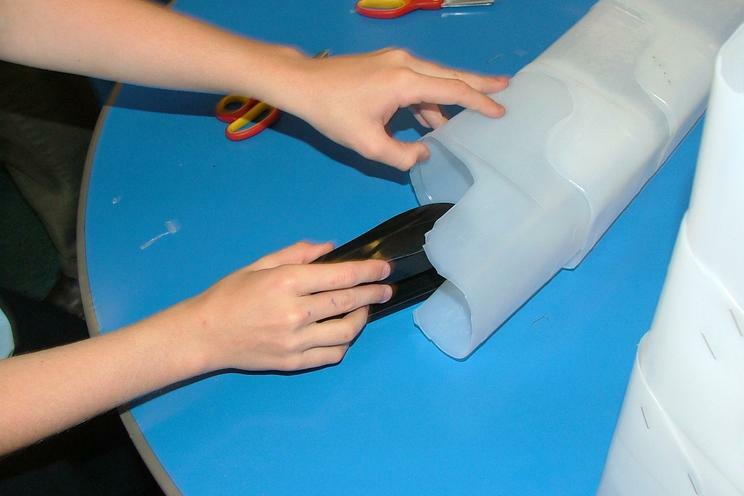 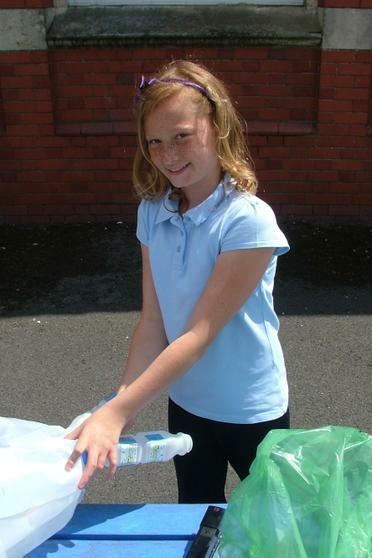 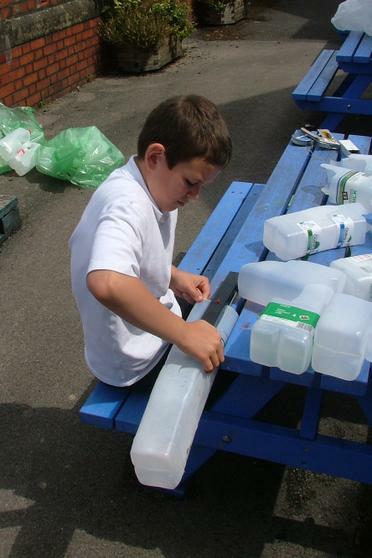 One of the reasons it is so easy to recycle is that not a lot of substances stick to it - including glues, which meant we had to look at different ways of joining it. 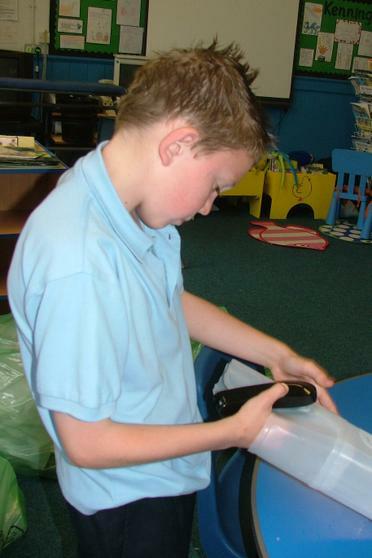 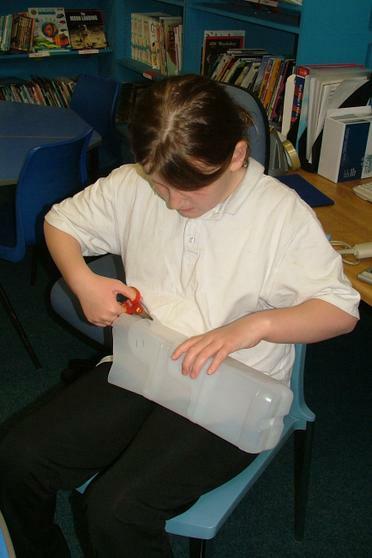 In the end the children found that a mechanical fixing such as staples and screws worked better than cellotape or any glue we could use. 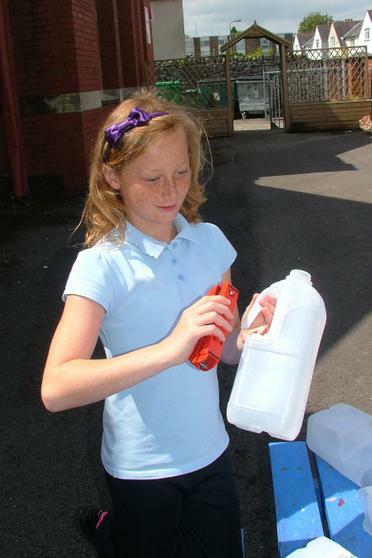 We did look at the other qualities of the milk bottle and its translucency. 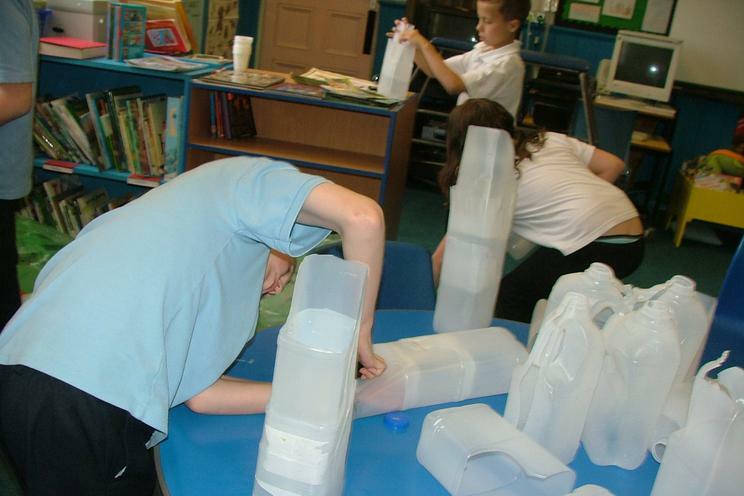 We talked about how we could put blocks of black and white poems or text or coloured paper protected behind the bottle to change its colour/tone. 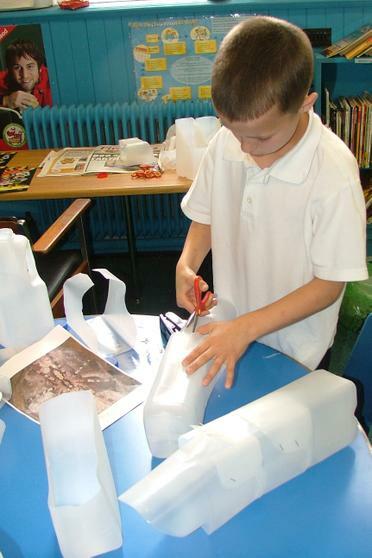 When we made our dragon sculpture/model we covered it in red paper and hid the old cardboard boxes underneath. 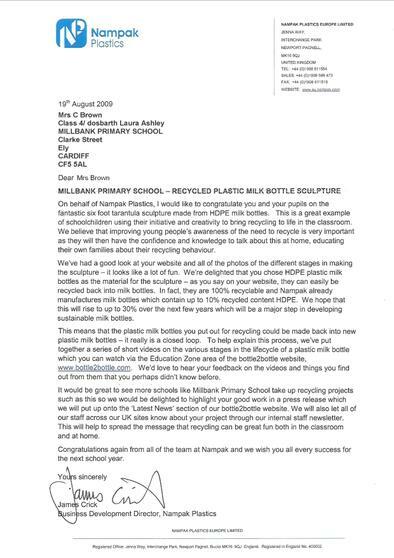 We discussed if it was appropriate to spray paint or decorate the Plastic milk cartons this time,in a recycled/rubbish sculpture were they more important here than just the framework? 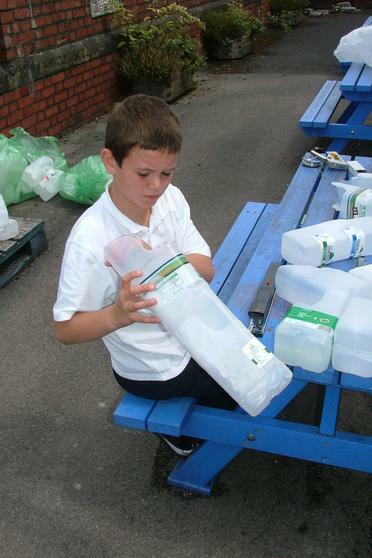 In the end the children decided to leave some of the labels on so you could recognise what the milk cartons were. 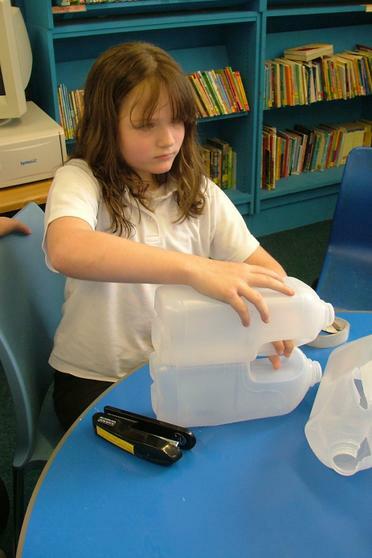 We also looked at different ways of using the bottle should we cut it up and use it as a sheet or try and keep its shape. 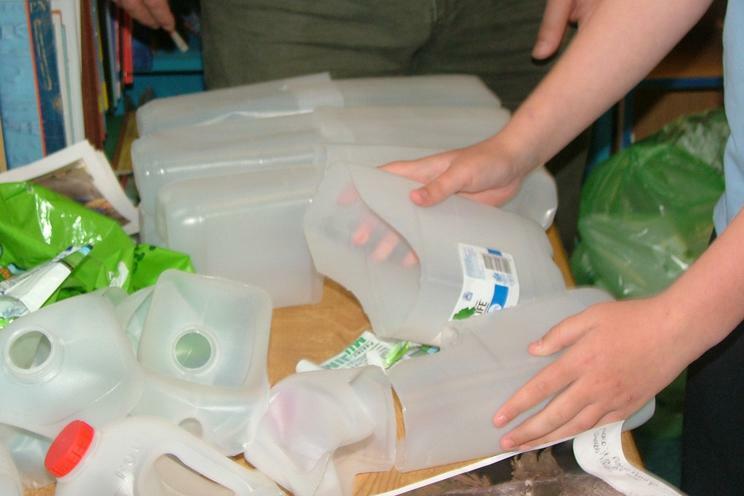 Even after it had been washed we found that we needed to cut the bottles open so we could properly clean them - milk can be rather smelly after a few weeks! 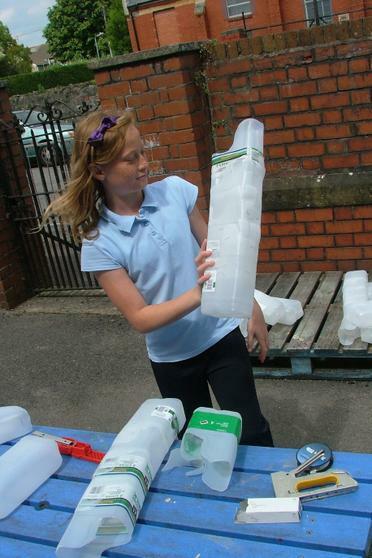 They stacked rather nicely and formed long thin rectangles. 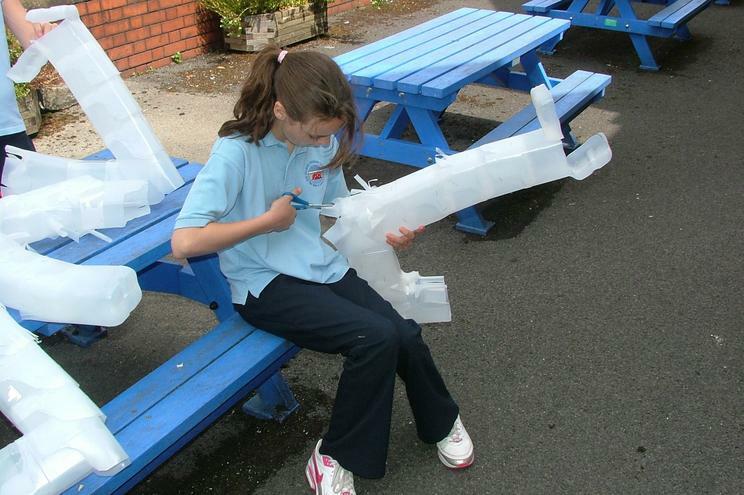 Sophie said "We wanted to make a big sculpture that we could all have a go at and each do our bit". 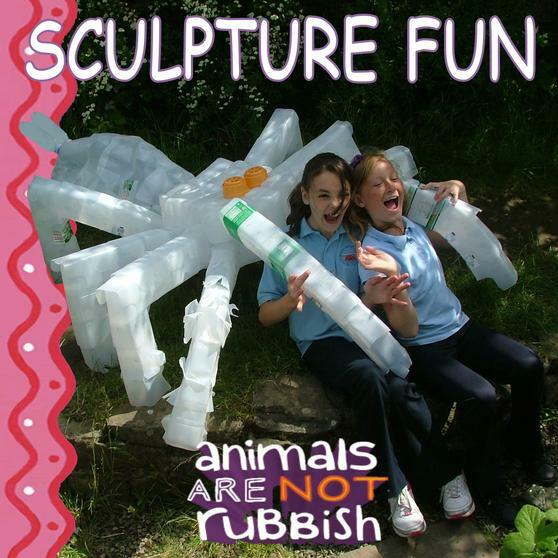 Of course the other main thing we looked at was what animal we wanted to sculpt. 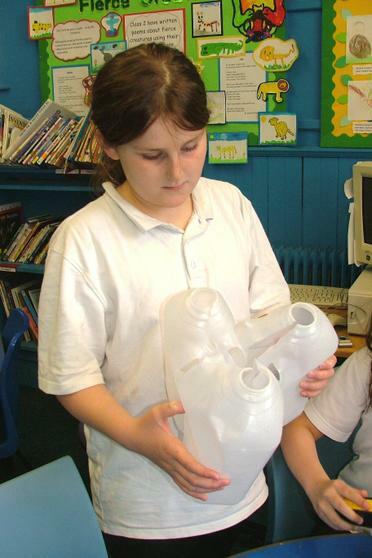 We all had different ideas Mrs Brown thought a nice sea turtle would look great floating over the classroom. 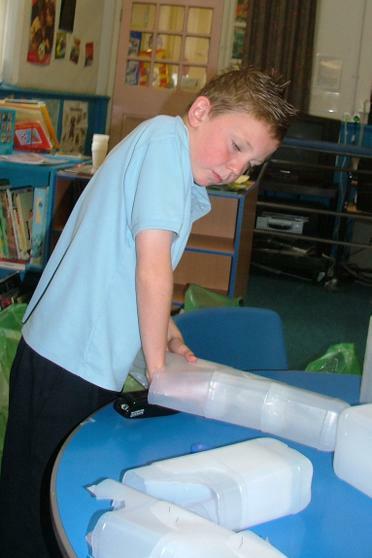 Mr Jones (a helper) wanted a big elephant Mr Vaughan wanted a gorilla hanging from the ceiling. 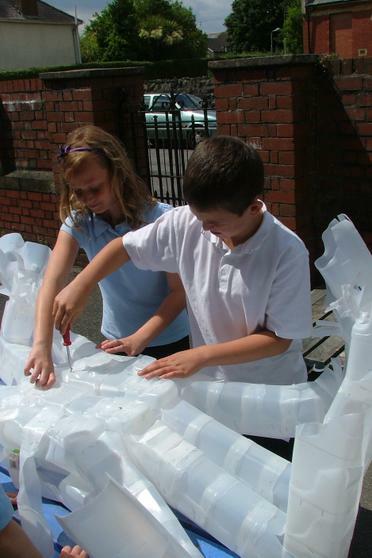 We all had our own ideas too from small flocks of birds to huge sculptures we could ride on. 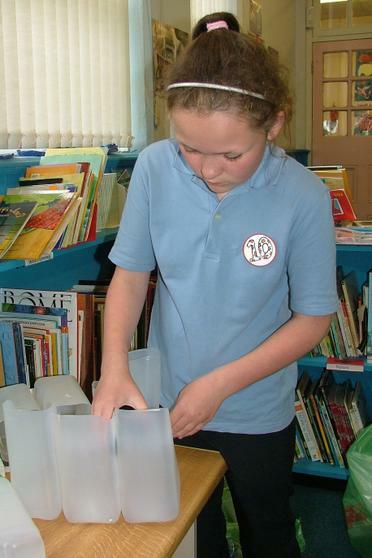 Mrs Brown gave us time to do some research a presentation and then we voted on what we thought would be the best endangered species to make. 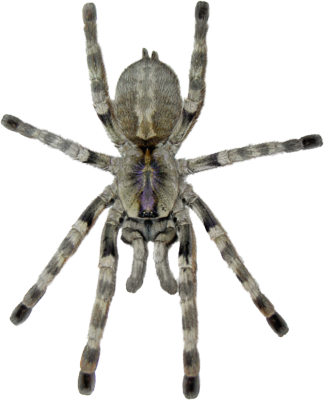 The best presentation was the Rameshwaram Parachute Spider. 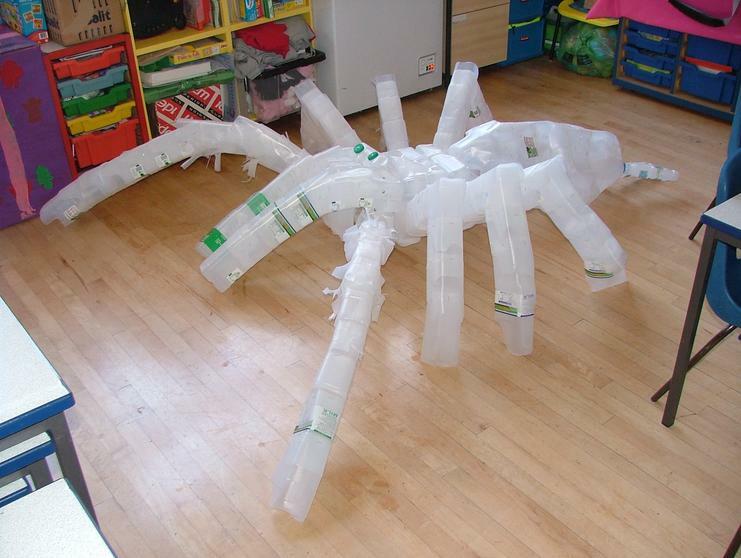 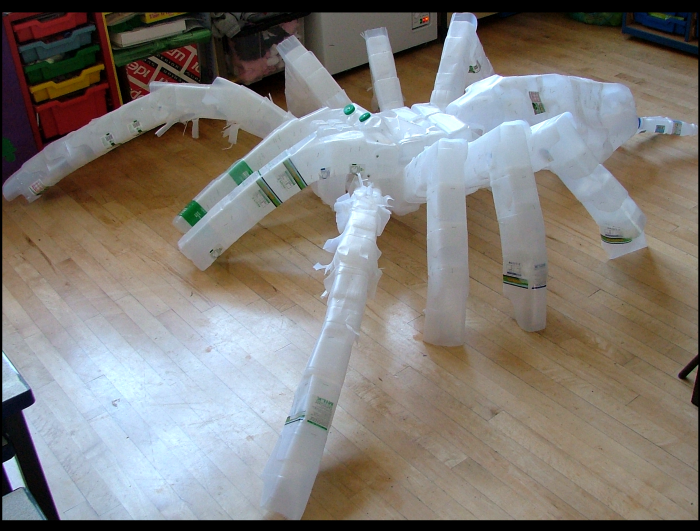 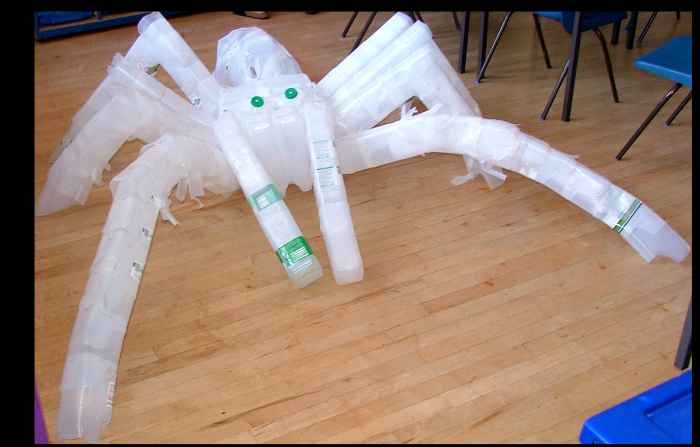 It had nice long legs suited to the stacked plastic bottles, it was greyish in colour so we did not need to hide the plastic bottles behind paint. 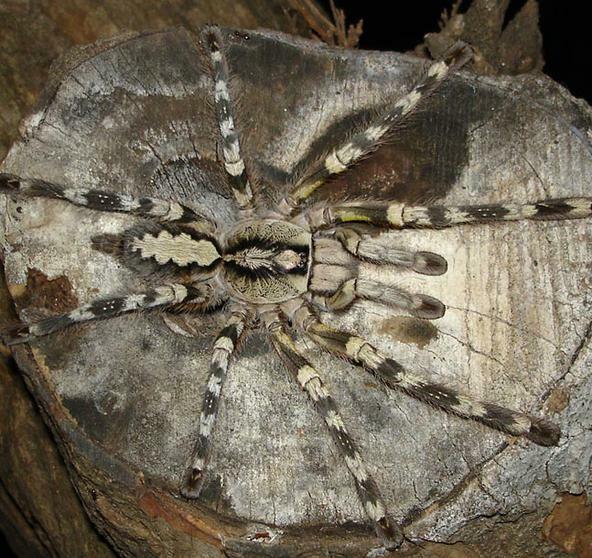 Lavina said "We wanted to choose an animal that was not so well known as being endangered, one that has recently come onto the endangered species list." 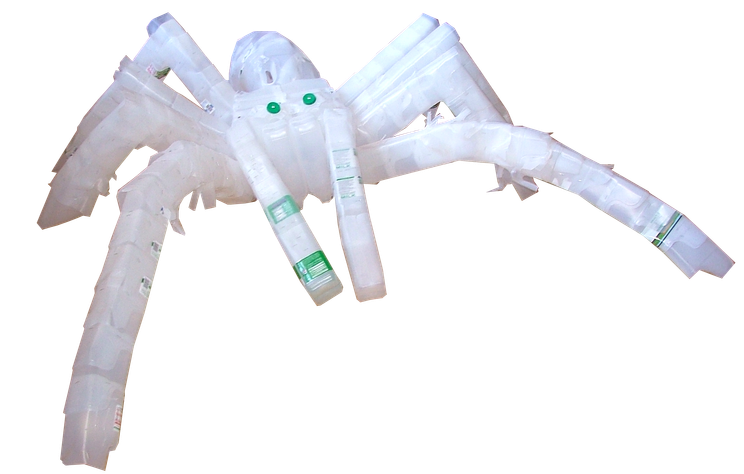 That way we could to try and make people think afresh about the issues of environmentalism in a way that they would not if we chose a creature they already were familiar with. 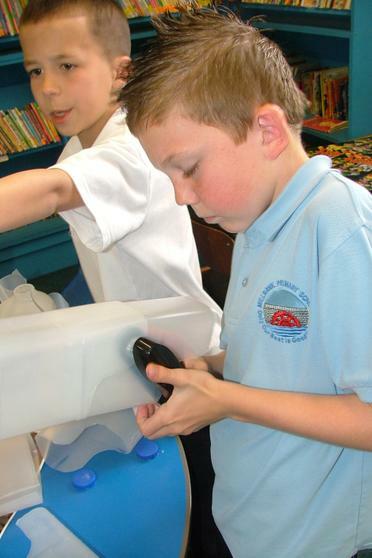 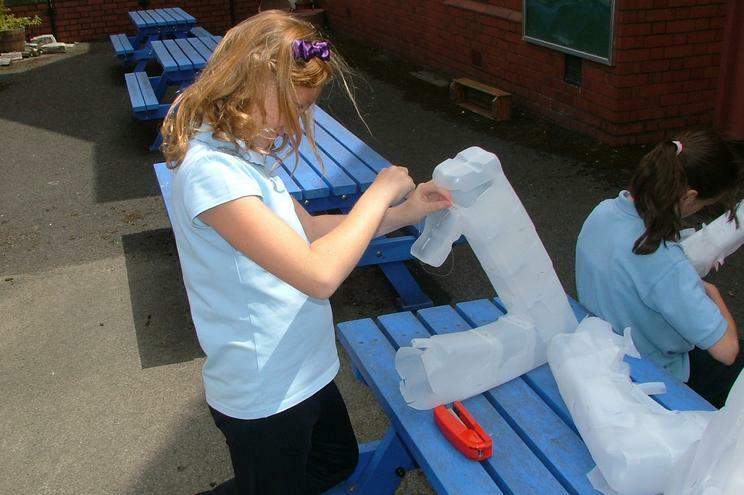 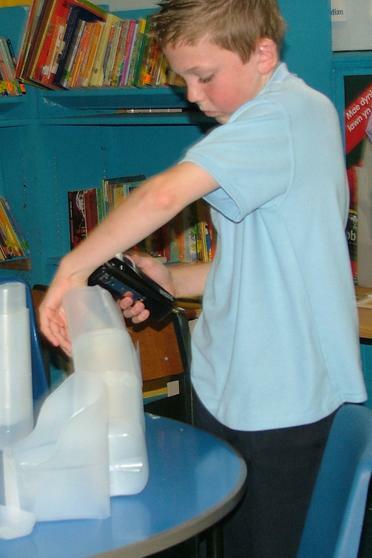 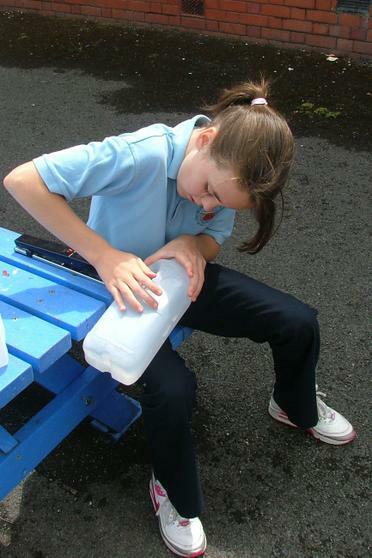 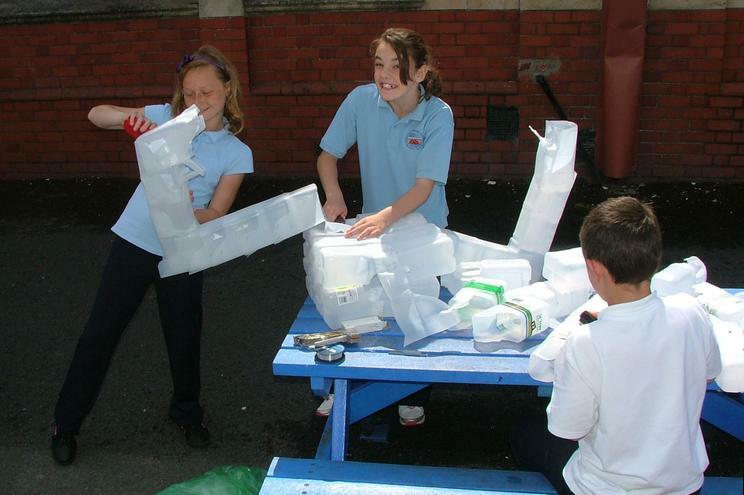 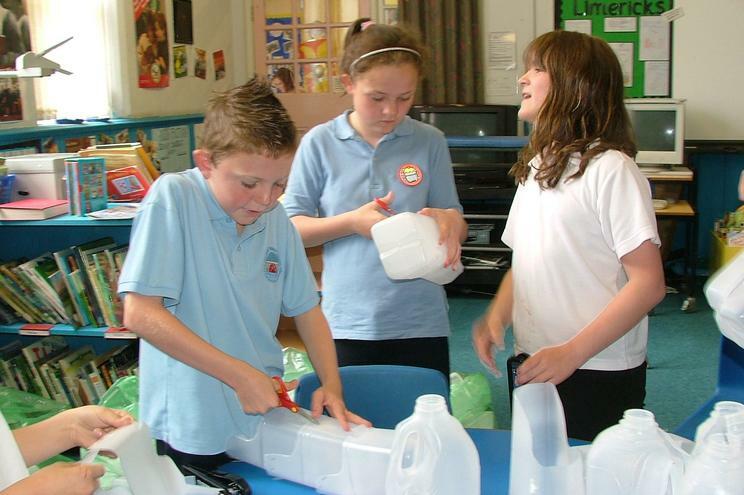 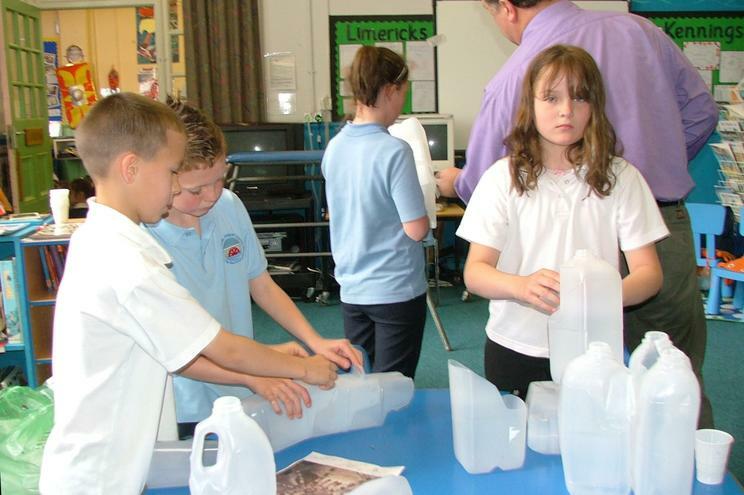 We have used the experience of 'playing with the plastic bottles' to create lots of other sculptures. 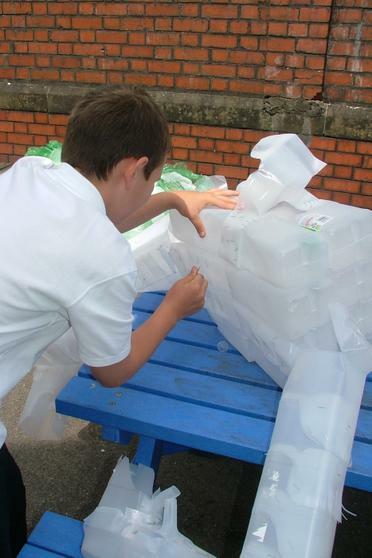 from elephants to monkeys and our now famous 'SKULL'ptures. 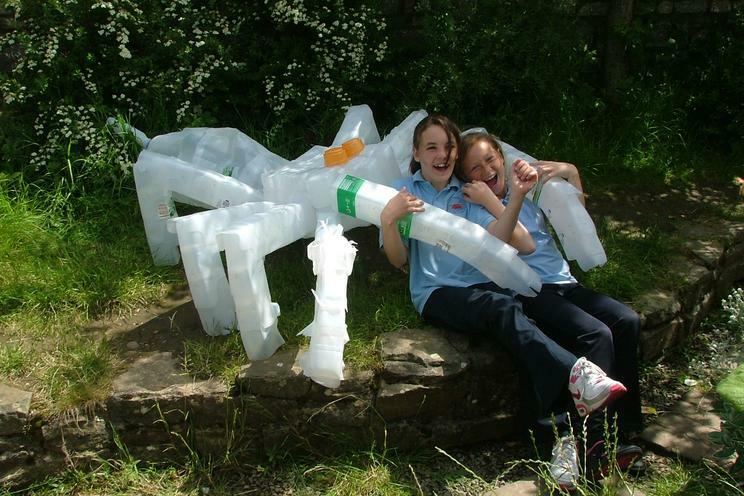 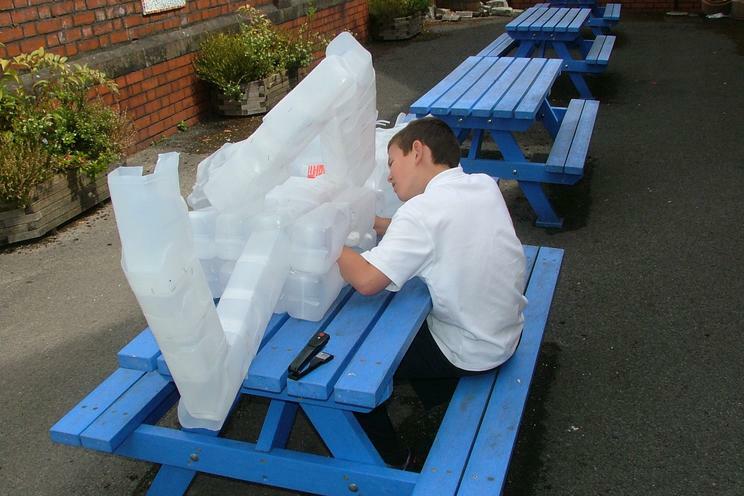 We used the plastic milk bottle sculptures on our entry in the schools wheelbarrow competition at the RHS which we used to raise the issue of plastic recycling to the wider community. 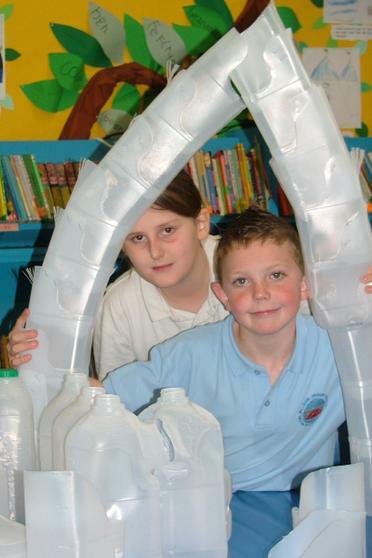 We were luck enough to win First prize. 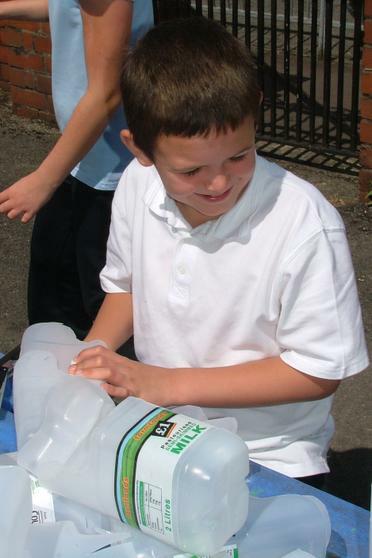 Why not have a go yourself.